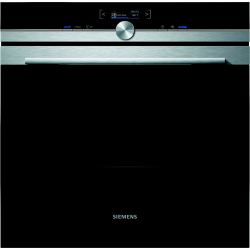 When you want the best on offer from the world of kitchen appliances, you definitely can’t go wrong where Siemens is concerned. The HB672GBS1B oven is no exception this rule with its eight useful functions, full colour TFT Display, soft closing door, and the revolutionary coolStart technology. So let’s talk about softMove for a moment. We’ve all done it, you’re in a rush, the stress is a building up, and a momentary lapse of judgement occurs; before you know it you’ve slammed the oven door. If you’re particularly unlucky you could even crack the glass, and nobody wants that situation on their hands! With softMove this problem is a thing of the past. Simply put, the HB672GBS1B door cannot be slammed. So what about coolStart? That’s a pretty cool feature (pun fully intended). The basic concept is that the oven can defrost and cook frozen items without any intervention; simply input the cooking time, and the oven pre-heats itself slowly causing the food item to defrost and then cook at the perfect speed. No more burned fish fingers that are frozen in the middle! Finally, the full colour TFT display. There isn’t much to say which isn’t already obvious from the name, but let us assure you this little screen is absolutely beautiful. Good resolution, defined colours, crisp text. It’s a fantastic addition to an already great appliance.